ModusDoc is a software developed for organizing documents, links, files, folders, applications and notes on your computer as a database. It enables quick access to any data stored in this database which consists of a table with entries. The ModusDoc database is customizable according to the user\'s preferences. The database a ModusDoc consists of table groups and table entries. Groups are represented on the two tabs Index and Tree, and Tree is generated automatically! Filtration system (selection), located directly above the tabs and groups on each table field recordings, you can easily and quickly find the information you want. The group could be merged documents (as inserted and connected - the link) shortcuts, created these documents, hyperlinks to Internet resources relevant to documents and programs represented in the group, as well as shortcuts to folders and notes. Link (shortcut) for one and the same object (document, program, folder, ...) can be presented simultaneously in several groups. 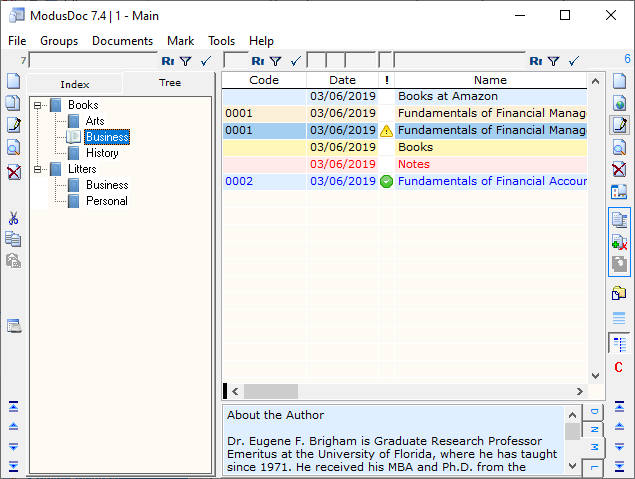 Restrictions on the type of files in the database, all objects ModusDoc that run by double-clicking or from start menu, run, and the collection software by double clicking on write ModusDoc or button on the toolbar. You can add database ModusDoc any documents shortcuts folder simply by dragging them from the desktop, start menu or from Windows Explorer. You can drag a hyperlink, selected text, e-mail messages, cataloguer ModusDoc automatically create the appropriate records (hyperlinks, or Notes). You can also add all the objects in the folder, simply pointing to the folder in the dialog box! Objects are written to the cataloger ModusDoc can be on local drives and on removable media and network shares. ModusDoc can create an unlimited number of databases with switching between them via a special table or list in the [File] menu. Each database can be configured individually: hidden columns rearranged, new. Planetsofts.com didn't scan ModusDoc for viruses adware, spyware, or other badware. For safety reasons, we recommend that you always keep an updated antivirus installed on your pc when downloading and installing software from the web.